Quick, easy, and delicious vanilla buttercream recipe. Reduce speed to low and add in icing sugar 1 cup at a time until well blended. Increase speed to med and beat for 3 minutes. Add vanilla and 2 Tbsp cream and continue to whip on medium for 1 minute. Add more cream as needed until desired consistency is reached (I added all 4 Tbsp). Whip until the frosting is smooth and silky. 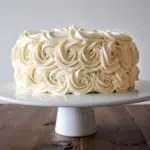 Use a 1M tip to do rosettes around the cake if desired.